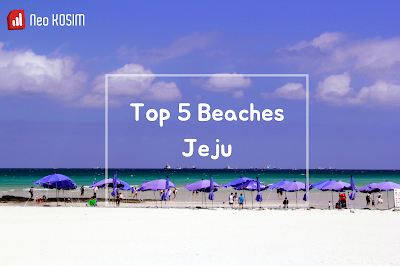 Who dare can resist this beautiful emerald color of beach in Jeju Island? Nobody can’t help falling in love with white sand, crystal emerald sea water and blue sky in there. The biggest island in South Korea, Jeju Island(제주도), is located in the southwest and far from one hour by plane from the capital Seoul. It is said that it was made by several times of volcanic eruption ever since made 700 to 1200 thousand years before. Thanks to mild and warm temperature all the year and specific volcanic activity results, this island has boasted diverse flora, dark gray volcanic rocks and ash soil, clean and awesome emerald color beaches. One reason for the island located far from main land added to result in present culture and nature. It has been well preserved till now and maintained as perfect stunning nature. 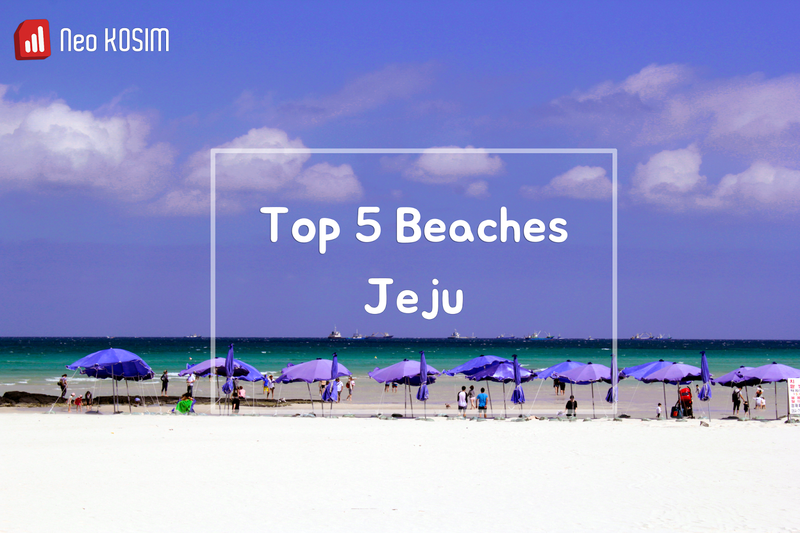 I’m very pleased to let you introduce these top5 favorite beaches in it. In recent years, 'To live in Jeju Island for a month' has become a popular wish. 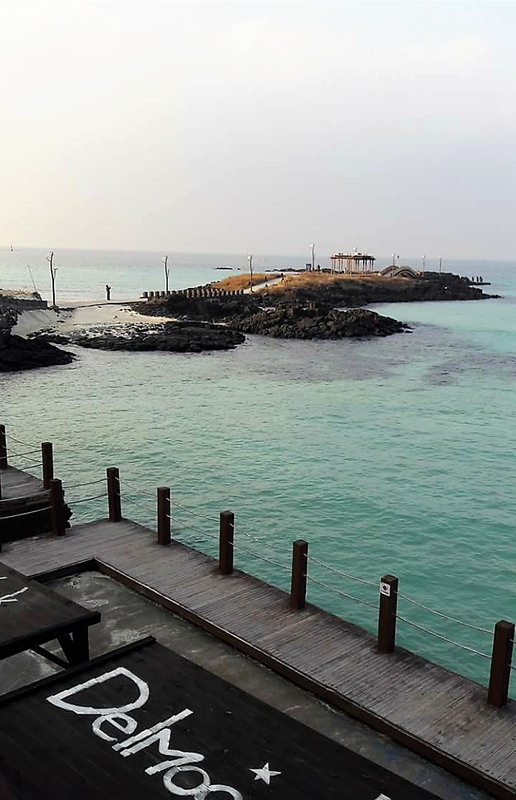 Hyeopjae, literal meaning is the very place filled with the precious charming natural gems, might be the best of the top beaches in this island. Emerald and cobaltic crystal clear water, shallow sea being good for family visitors, white sandy beach containing the shell powder, in particular, dark gray basaltic rocks zone, brilliant blue sky and the tiny islet(Biyangdo island비양도) in front of beach seems like to be easily touch if I stretch hands. With all of these perfect matching, this has been much loved since so long times ago and till now. This is located on the west side far away and twenty minutes from Jeju airport. So it always shows gorgeous sunset. Seasonal strong wind in winter time from the northwest annually, has formed sand dune. It was another pleasure for me to stroll pine forest behind sand dune. Tropical Hallim Park(한림공원)next to this, just five minutes on foot, is another tourist attraction too. Don’t miss it, either. This is the closest black colored sand and gravel beach on the west bound far from 20 minutes from the airport. Here is also popular for sunset. Jeju island was the specialized area which provided the war horse about since eight hundred years to modern era. Horse is the specialty of this island. The red and white pony lighthouse facing up each other on this beach symbolized its’ unique old horse. Absolutely. These two are actual lighthouse. To my regret, I had to leave this tiny charming beach before lighting at night due to catch my return flight. ‘Woljeongri’ means the small village where the moon is staying. However unlike what the romantic name shows, this is a little uncomfortable and hard seashore village because of the strong sandy wind and threatening waves over seawall. With this reason price land of this area is lower than other area of this island. But the value of this is not the same as before. It became ten times higher at now as compared in the just three or four years before. Why? See the exotic aero-generators in the beach. What’s more, there are many distinct characteristic cozy cafes along the seashore. The strangers who loves this island from the main land of Korea opened this kind of romantic zone and rooted here became real Jeju citizen member (up to ten percentage of this residential population at now). This is hot tourist attractive essential date course for young couple. It is far away one hour on the east bound from airport by the car. 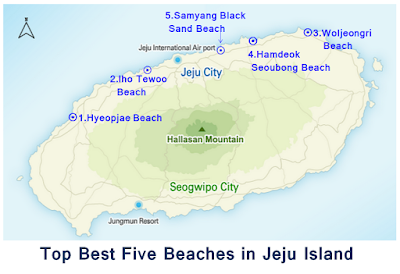 4.Hamdeok Seoubong Beach (함덕 해수욕장) This is the biggest beach within island which is sandy beach 900 meters in length, 120 meters in width and 1.2 meters in depth. This is good for family visitor because there is no big wave, has shallow sea and additional facilities are well equipped. Don’t skip the view from the café Delmoondo(카페 델문도) in this beach. This is simple and homely glittering black colored sandy beach and it is relatively unknown to tourists. People enjoy the sand bath in here. It is far away on east bound 35 minutes from the airport. Check out NeoKOSIM solutions with the best unlimited data, calls, texts service let you share your travel experience and stay in touch with friends and family till back home. Stay surf without hassle!